As a homeowner, you have a list 10 miles long of all the things that could potentially go wrong with your home. You probably also have a super long list of repair options for all of those potential problems. But, if you’re like me, your budget isn’t nearly as long as either of these lists, so you find yourself wondering how to pay for your repairs. You may have also realized that there are several Do-It-Yourself options that allow you to take matters into your own hands, allowing you to save money right off the top. But are all of those DIY options as reliable as hiring an expert? How do you know if your own DIY skills are adequate enough to perform the task at hand? What if you start a project, only to realize that you’re in over your head, forcing you to call a contractor anyway? Luckily, in the chaos of all of these scary questions, one solid answer emerges. And while it’s not applicable for every issue you’ll face with your home, DIY carbon fiber kits give you the power to structurally reinforce your own home in a matter of hours. Unsure about your own abilities? You’re Stronger Than You Think! Installing StrongHold™’s carbon fiber systems is probably one of the easiest home improvement projects you can take on. As one StrongHold™ customer put it, “it’s easier than applying wallpaper.” People from all walks of Earth, with no experience in home remodeling or any other kind of repair project, have been structurally reinforcing their bowing and cracked walls and floors in less than one day. To date, StrongHold™ has been used in more than 10,000 homes without a single callback. 1. Grind off all paint and delaminated concrete. 2. Vacuum or brush away all dust. 3. Wipe the wall with acetone. 4. Prime the wall with StrongHold™ epoxy. 5. Saturate both sides of the carbon fiber fabric. 6. Press the carbon fiber fabric against the wall. 7. Apply another layer of epoxy. That’s it! After installing your StrongHold™ kit, you can paint right over it to minimize the appearance of repair. If you decide to paint your wall, do so while the epoxy is still thumbprint tacky (about an hour after installation). 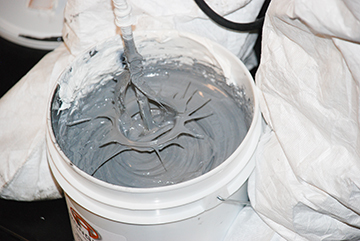 If the system has already cured and you want to paint it, lightly sand the surface to abrade it before painting. Want more information about StrongHold™’s DIY Carbon Fiber systems? Contact us today at info@hj3.com!